It's weekend - enjoy! I'm planning on enjoying a quiet and restful one here, but hope you have fun whatever you have planned. I have a hybrid page to share today. 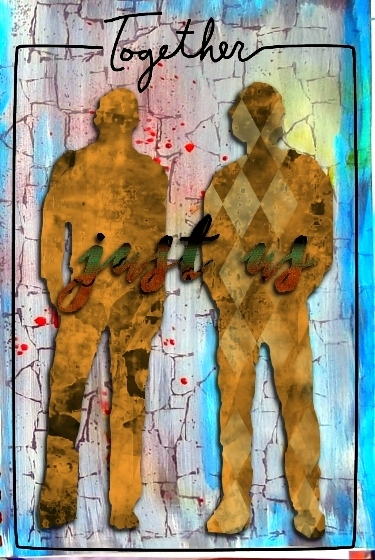 The background was painted, stamped and crackled and then added to my graphics programme. The figures are ones I drew and cut out for another project, and have re-used here. 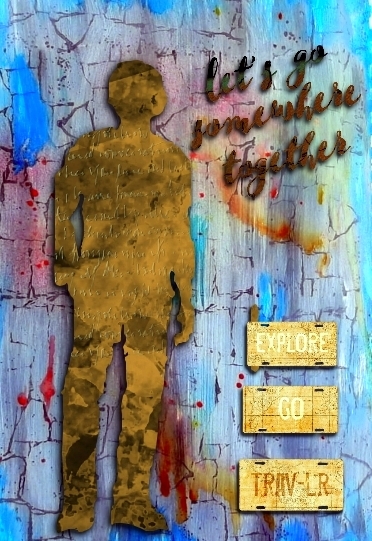 The together quotes and frame are from Serif. Your journal spread is beautiful. The images you drew and cut out are wonderful. I am so in awe of this entry. It is beautiful. I also like your tag because I am in LOVE with your hand carved stamps. This is wonderful and shows how talented you are. Even for 10 days ago, your springtime weather is so much further along than ours. Enjoy the spring beauty like I did the photos. Great bull sculpture. Oops commented on the window display a bit early sorry. dein Seite ist wunderschön an zusehen und der Stempel ist wieder grossartig mit den zwei Farben der Rabe! I like the colors and how your cutouts really stand off the page. Your rubber stamp carving is amazing. I enjoyed your walk today. The florist really knows how to entice people into the shop. Love the blue lingerie though it looks better on the mannequin than it would on me. (-: Enjoy your weekend! Beautiful journal page, stamp carving and photos. Beautiful color and texture throughout! Oh Stacy would/will love your Tuesday Tag. What a wonderful walk. Look at that cow/steer! Lovely hybrid page and tag! Looking forward to some greenery around here, lovely photos. Enjoy your day in. Happy Weekend, I love your newest art page and tag and of course I love loved all of your photos. and wow so cool that you carved your stamp-that's so wonderful! Wow! That carved stamp is really amazing and it looks so good with the yellow. Love it! Super photos too! Deine Journalseiten mit dem gehackten Hintergrund sind klasse und der Rabenstempel ist auch sehr gut gelungen. Von deinen Fotos gefällt mir das mit der Blumendeko auf dem Stuhl so gut, aber auch alle anderen Fotos sind gut gemacht. Es ist schön, daß endlich Frühling ist. Schönes Wochenende . 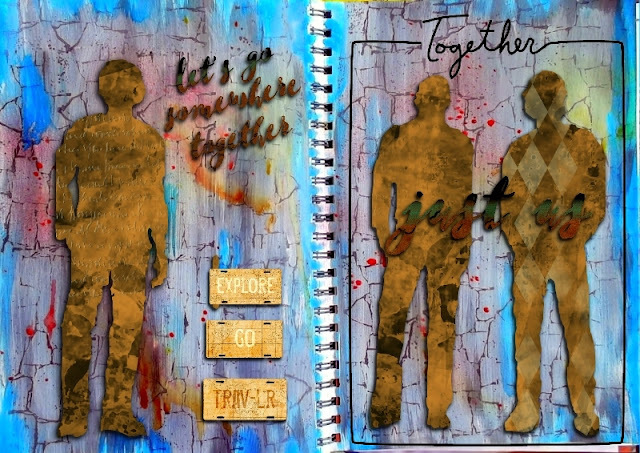 Its a great journal spread, I love the cut out silhouette figures you used. Its a fantastic tag with your own carved stamp as well. Lovely photos it is good to see the fresh greens and the trees with their leaves. I liked seeing in the shop windows as well. Love your backgrounds! They turned into wonderful pieces. Great photos. Thank you for stopping by my blog. Great Journal Layout! Love all of the textures and colors. Your Spring photos look great... we are so late with Spring this year it scares me to think of what Summer will be like. Fabulous journal page with that added crackle and so nice to see the evidence of sunshine within your beautiful photography, it's amazing how a little sun illuminates the sky. We had a lovely sunny day here yesterday so made the most of it, today I think the weather has yet to decide what the day will bring. Oh my, such beautiful photos, Valerie! I fell like I was on the walk with you. Thanks so much for sharing them. And your hybrid piece and stamped tag are absolutely amazing in every single way! HUGS!! Beautiful! I really like the background with all that wonderful crackle. Such a wonderful hybrid piece. Your hand carved stamped looks really neat with the sunburst background. Such lovely photographs, it's so nice to see some green, some blue and those flowers are so colourful too. Hope your weekend has been wonderful - here's to the new week ahead. deine seiten sind heute so wunderschön,das ist jetzt eine fav seite von dir,super mit den gemalten männern und wie du alles kombiniert hast,einfach klasse,der crackle hintergrund passt so super dazu. schöne bilder hast du wieder gemacht,das wetter ist bei uns gerade sehr schön,außer gestern,da hatten wir regen. eine schöne neue woche für dich. Is that a bird or duck in the first photo? And what kind of bird/duck? Hope your week is filled with wonder, my friend. I love your art piece and I love your stamp!! So creative! Stunning photos! Wow!!! Big Hugs! Fabulous art journal pages!! I really adore the woodblock printed look of your handcarved stamps - you are very talented!! !